If you movie isn’t already in one of the Apple TV supported formats or it’s still on a DVD or Blu-ray, you’ll need to encode/re-encode it first. I’ll show you how. I’v had the pleasure of using an Apple TV (3rd generation) these past few months, and I can say without reservation that it is an excellent streaming box. For me, it was the combination of on-demand media and easy access to my own extensive media library that made Apple TV’s case, not to mention an attractive price tag. 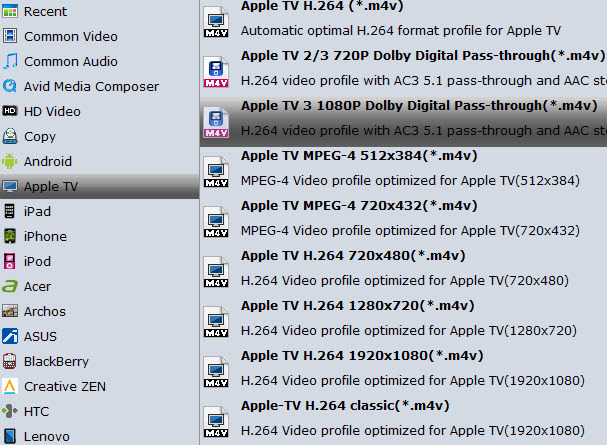 The only problem I’ve encountered so far, is Apple TV’s meager support for video formats. Officially, the Apple TV only supports MP4, MOV and M4V video. However, most of my movies are formatted in MKV, VOB, AVI, or on DVD and Blu-ray. Of course, I’m not about to pay iTunes’ ridiculous prices to watch movies and TV shows I already own. Instead, I’ll just need to encode/re-encode them first. If you’re interested in doing likewise, check out the way to play back your MKV, VOB, AVI, TiVo, MPG, even DVD and Blu-ray on the Apple TV. First you need to download Brorsoft Video Converter Ultimate, an all-in-one video, DVD and Blu-ray solution, which is available for Windows and Mac computers. 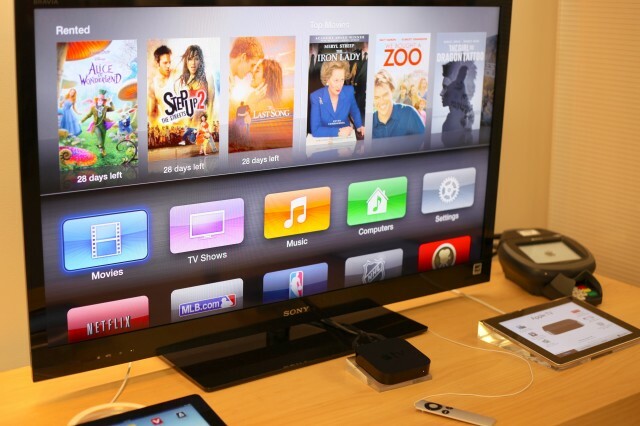 It has many outputs for all Apple TV models, as well as the iPhone, iPad and iPod Touch. The program also support convert video files to Apple TV while keeping the Dolby Digtial 5.1 sourround sound. If you are having problems playing your own media on Apple TV, chances are you already installed this great utility. If not, download it from here (or the Mac version here). Now refer to the steps to get it running. Step 1: Download, install and launch Brorsoft Video Converter Ultimate. Step 2: Click on the Add Files button to add video files or load DVD or Blu-ray files. Step 3: Click “Format” bar and turn to the Apple TV category. 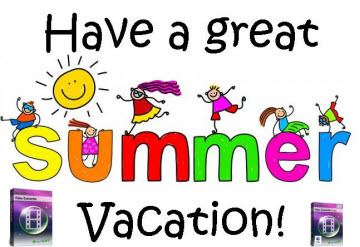 The program has a number of presets for Apple TV, Apple TV 2, and Apple TV 3rd Generation, to export a Apple TV 3 1080p video with ac3 5.1 passthrough for AV receiver decoding, “Apple TV 3 Dolby Digital Pass-through (*.m4v)” preset is recommended. Note: By choosing this format, you will get two sound tracks in the result M4V video, one is stereo, and the other is AC3 encoded Dolby Digital 5.1 pass-through. Whne you Apple TV is connected to audio receiver, the 5.1 surround sound will work. When ATV is connected to your HDTV only, the stereo track will work. Step 4: If you’re not satisfied with the result videos, you can click “Settings” to adjust codec, aspect ratio, bit rate, frame rate, sample rate and audio channel in the interface according to your needs and optimize the output file quality. Step 5: After everything is OK, simply click the big “Convert” button to start converting videos for the Apple TV. Step 6: Once the encoding task completes, you can run iTunes and click “File” and “Add File to Library” to add the result videos to iTunes library. And then you can stream it to your Apple TV. While, from the specifications of the Apple TV, the supported file format is H.264 video with stereo audio in .m4v, .mp4, and .mov file formats. Besides, the iTunes can not support AC3 5.1 files well either. So, how to make full use of your output 1080p H.264 video with AC3 5.1 sound? Here there’s the solution to it. First, with an iPad 2 or iPad 3, you can stream video to Apple TV with AC3 5.1 (Dolby Digital) sound via Airplay. Then, since the new Apple TV is not able to decode 5.1 surround sound to stereo by itself, if you want to play AC3 5.1 (Dolby Digital surround) audio you will need an AV receiver. Applet TV (including 2nd-gen and 3nd-gen) does not decode the surround audio itself, it will pass through the audio to AV receiver for decoding. If you do not have the AV receiver and connect Apple TV directly to your HD TV with HDMI, then there will be only video without sound while playing surround sound movie. But Apple TV itself just works ok with movie of stereo sound.